Following the coastline of Bruny Island, you might chance upon a rock formation that bears a striking resemblance to one of the great explorers in history. Bruni D’Entrecasteaux has not only lent his name to our Island of wonders but also his silhouette …and if the fates had been a little different he would have certainly have discovered the Strait that made us an island state, five years before Bass. D’Entrecasteaux having identified the same Venturi effect as Bass, felt obliged to continue his search for La Pérouse. In 1791 Bruni D’Entrecasteaux on the Recherche, along with Huon de Kermadec on the Esperance was chosen by Louis XVI to lead the search for La Pérouse, and further exploration and scientific discoveries. It was during the voyages of 1792 that D’Entrecasteaux discovered the channel that bears his name and the river that was named in honour of Huon. The discovery of the channel cemented the knowledge that the land mass on which Adventure Bay was situated was indeed an island, one to which Admiral Bruni D’Entrecasteaux would give his name. Returning to Van Diemen’s land in 1793 they partially circumnavigated Bruny Island. Travelling from Recherche Bay along the Channel once more, they moved further north discovering the Derwent River which he was to name La Rivière du Nord, and on to Adventure Bay. Thereby joining the long list of previous and future explorers to have landed there. “It would be vain for me to attempt to describe my feelings when I beheld this lonely harbour lying at the world's end, separated as it were from the rest of the universe- 'twas nature, and nature in her wildest mood. “J E tenterois vainement de rendre la sensation que me fit éprouver l'aspect de ce havre solitaire, placé aux extrémités du monde, et fermé si parfaitement, que l'on peut s'y considérer comme séparé du reste de l'univers. Tout s'y ressent de l'état agreste de la nature brute. L'on y rencontre à chaque pas, réunies aux beautés de la nature abandonnée à elle-même, des marques de sa décrépitude; des arbres d'une très-grande hauteur et d'un diamètre proportionné, sans branches le long de la tige, mais couronnés d'un feuillage toujours vert : quelques-uns paroissent aussi anciens que le monde ; entrelacés et serrés au point d'en être impénétrables , ils servant d'appui à d'autres arbres d'égale dimension, mais tombant de vétusté et fécondant la terre de leurs débris réduits en pourriture. The Venturi effect describes an increase in velocity as fluid is forced through a constriction. Named after Italian physicist Giovanni Battista Venturi (1746-1822). This phenomenon is observed in earth sciences as increased wind speed and decreased pressure as air flows through a mountain pass or as an increased current as tides propagate through a coastal inlet. In both these cases flow accelerates to conserve volume. Hill, D. (2013). The great race. 1st ed. Australia: William Heinemann. Entrecasteaux, A., Duyker, E., Duyker, M. and Rossel (2001). Voyage to Australia & the Pacific, 1791-1793. 1st ed. Melbourne: Melbourne University Press, pp.32-59,139-156. Hogg, G. (1938). D'Entrecasteaux: An Account of His Life, His Expedition, and His Officers by G. H. HOGG (Read 12th April 1937, R.S. Tas.). [online] Eprints.utas.edu.au. Available at: https://eprints.utas.edu.au/13231/1/1937-Hogg-DEntrecasteaux.pdf [Accessed 28 Jun. 2018]. 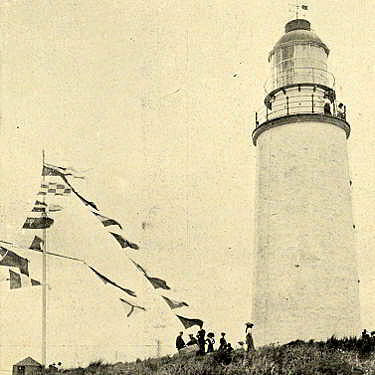 Cape Bruny Light keepers have been doing battle with nature since 1838. Tending the light to ensure that maritime travellers did not meet the same grisly end as so many before them had done, it was an arduous and unrelenting life.